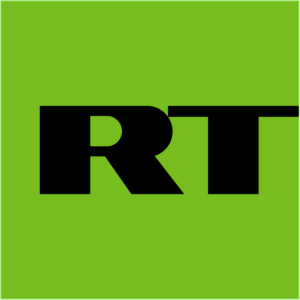 Earlier this year, the director of marketing and sales at the Austrian Mint confirmed to Bloomberg in an interview that the Mint’s combined gold bar and gold coin sales in 2015 had totalled 1.32 million troy ounces, a 45% increase on 2014, while the Mint’s silver sales in 2015 had reached 7.3 million ounces, a figure 58% higher than in 2014. 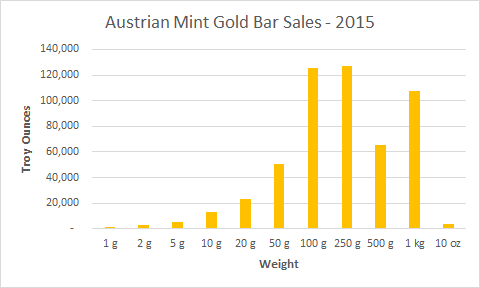 Since Münze Österreich, or the Austrian Mint in English, only publishes its annual report in July of each year, we had to wait a few months to see the granular details behind these sales numbers. 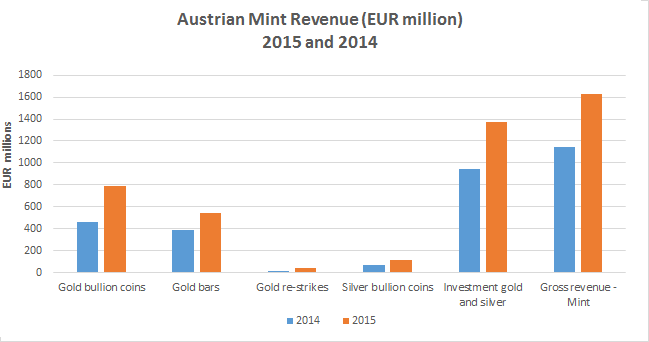 Now that the Austrian Mint’s 2015 Annual Report has been published, the detailed sales figures are as follows. 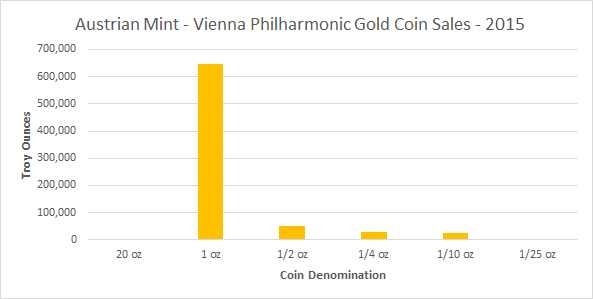 In 2015, the Austrian Mint sold 756,200 troy ounces (23.52 tonnes) of Vienna Philharmonic gold coins, of which 647,100 troy ounces (20.18 tonnes) were in the form of its flagship 1 oz Vienna Philharmonics, with the remainder comprising ½ oz, ¼ oz, 1/10 oz and 1/25 oz gold Philharmonic coins, as well as a handful of the Mint’s very large 20 oz gold Philharmonics. Gold Philharmonic sales in 2015 were 56% higher than comparable sales of 483,700 ozs in 2014, and were also higher than 2013’s figure of 652,600 ozs. Philharmonic gold coin sales in 2015 were the third best year on record, just slightly lower than 2008’s total sales of 795,000 ozs, but still well short of 2009’s bumper sales total of 1,036,000 ozs, when that year’s finanical crisis was in full flight. 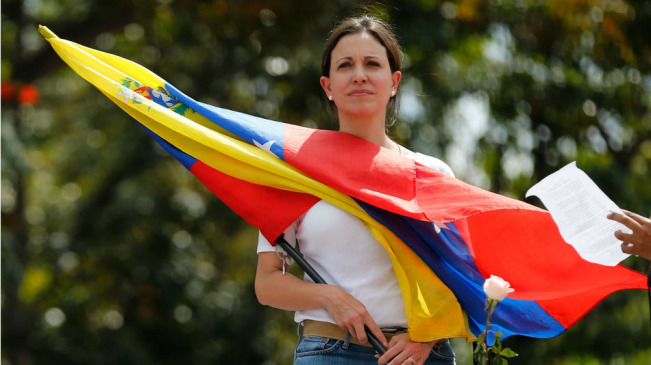 Turning to gold bars, the Mint sold 524,722 troy ounces (16.32 tonnes) of its branded gold bars in 2015, over half of which comprised sales of 1 kg, 500 gram and 250 gram gold bars. 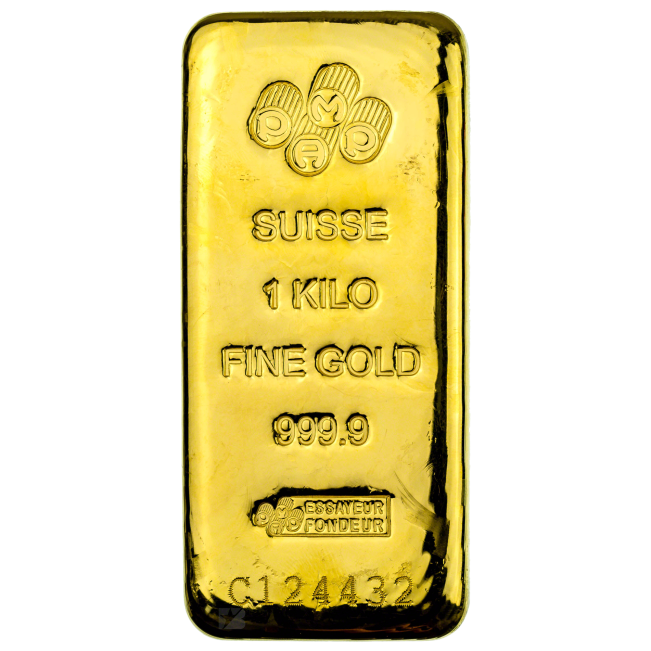 The 2015 gold bar sales were nearly 28% higher than 2014 gold bar sales of 410,300 ozs, but slightly less than 2013’s comparable sales of 711,200 ozs. In addition to gold Philharmonic coins and gold bars, the Austrian Mint also produces a series of historic re-strikes of original Austrian circulation gold coins in the form of gold ducats, gold guilders and gold crowns. In 2015, sales of these gold re-strike coins, mostly ducats, accounted for 37,700 troy ounces of gold (1.17 tonnes), which was a 128% increase on the previous year’s sales of 16,500 ozs. 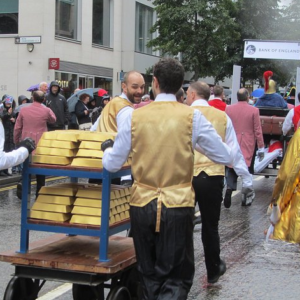 Overall, in 2015, the Austrian Mint sold gold coins (Philharmonics and historic coins) and gold bars containing 1,318,700 ozs (41 tonnes) of gold. In 2015, the gold Vienna Philharmonic’s largest markets were Europe followed by Japan and North America, and notably the gold Philharmonic was the best-selling major gold bullion coin in both the European and the Japanese markets. 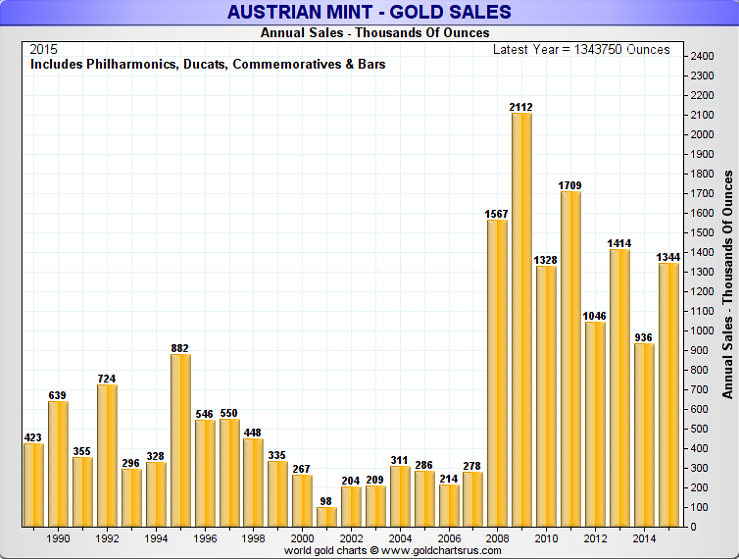 Looking at the long-term chart above, you can see that total gold sales (by volume) at the Austrian Mint during 2015 were noticeably higher than in 2014 and approached the gold sales figures of 2013, however they were still below the multi-year high sales figures from 2008, 2009 and 2011. 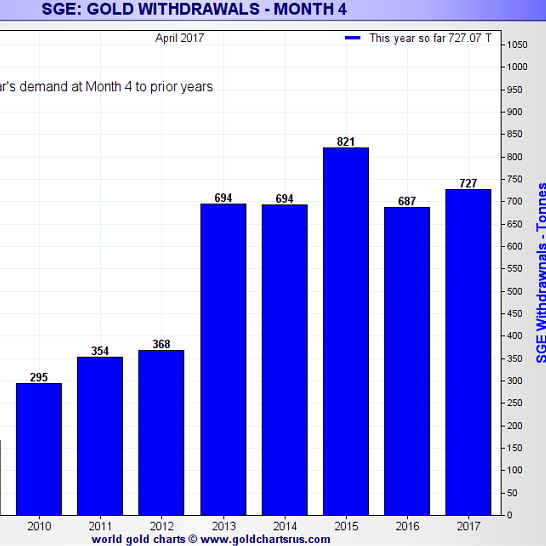 Notice also that for the last 8 years there has been a trend of the Austrian Mint’s gold sales following a high one year, lower the next year pattern, possibly due to risk on / risk off sentiment among gold investors depending on how the general financial markets were performing. 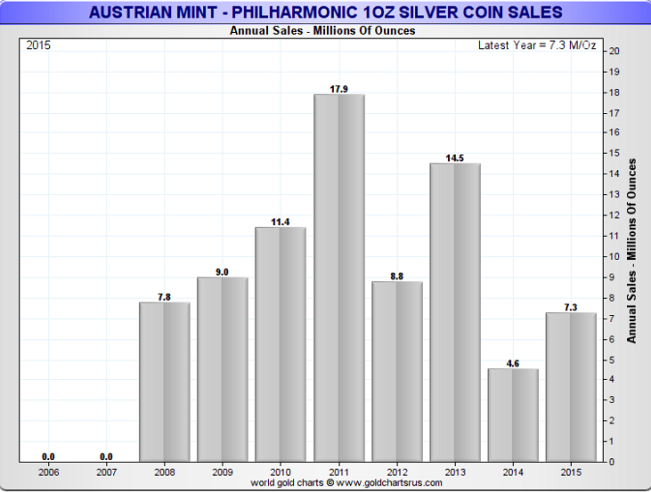 As the Austrian Mint does not fabricate silver bars, the Mint’s silver bullion sales are exclusively from the silver coins it produces, specifically the 1 ounce silver Vienna Philharmonic coin. In 2015, the Mint sold 7.3 million silver bullion coins containing 227 tonnes of silver. The largest markets for the Mint’s silver coin sales in 2015 were North America, followed by Europe. Silver sales in 2015 were also notable in that it was the first time that the Mint’s silver coins sales in the North American market surpassed those in Europe. Looking at a long-term chart of Austrian Mint silver sales, you can see that 2015 was a year of recovery following relatively low sales in 2014, which was partially due to an increase in VAT on silver sales in Germany in 2014. The Mint’s silver coin range also includes historic re-strikes of a Maria Theresa Taler coin in uncirculated and proof editions. 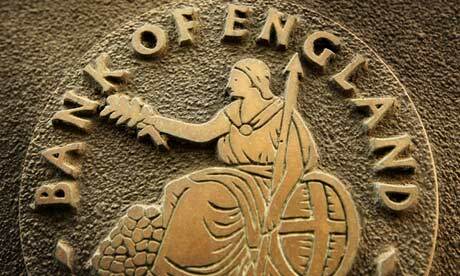 These coins contain 23.39 grams of pure silver (approximately 0.2 tonnes). These coin sales are classified separately from silver bullion coin sales and their sales are quite minimal. In 2015, sales of these Taler coins reached 9,777 pieces, slightly down on 2014’s sales of 11,470 pieces. 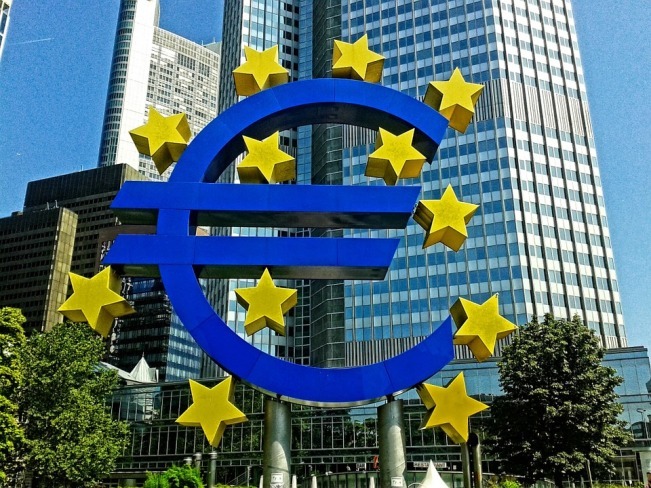 In terms of Austrian Mint revenues, gold bullion coins (gold Philharmonics) generated revenues of €788.9 million in 2015, up 70% on 2014’s €464.2 million. Gold Philharmonics were also 48.5% of total Mint revenues in 2015. Gold bar revenues of €547.3 million were 40% higher than in 2014, and accounted for another 34% of all Mint revenues. Silver coin sales in 2015 reached €111.3 million, 58% higher than in 2014. 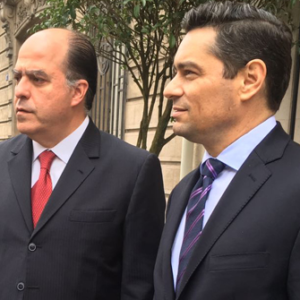 Adding revenues from gold coin re-strikes of €40.4 million, the total revenues from gold and silver coin products reached €1.37 billion, which was 84.7% of total Mint revenues for 2015. 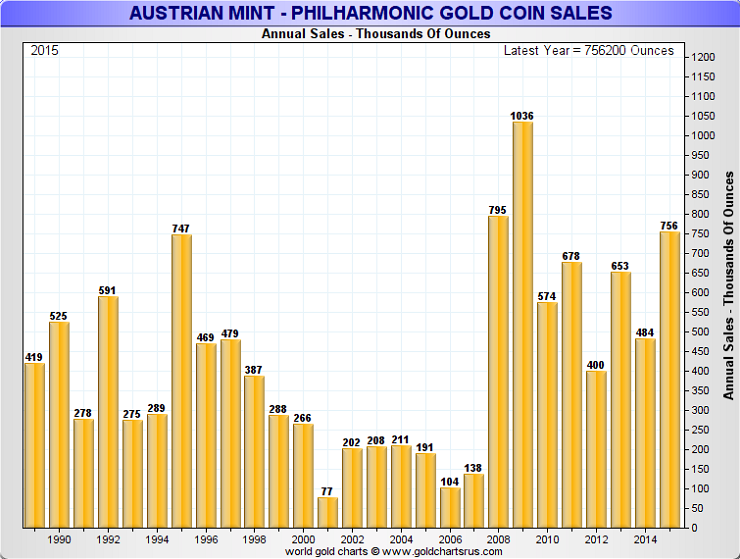 In terms of revenues, annual gold sales at the Austrian Mint are far higher than its silver sales. In volume terms, the Austrian Mint also produces more gold products than its counterparts but far less silver products than its counterparts. 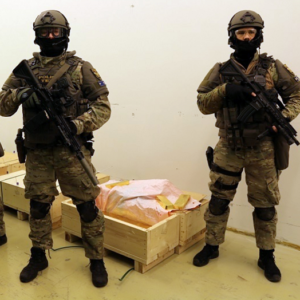 So the Austrian Mint could be said to be a gold specialist. For example, in 2015, and just looking at bullion coin sales, the US Mint sold gold bullion coins (American Eagles and American Buffalos) containing 31.8 tonnes of gold, but silver bullion coins (predominantly American Eagles) containing 1,495 tonnes of silver. 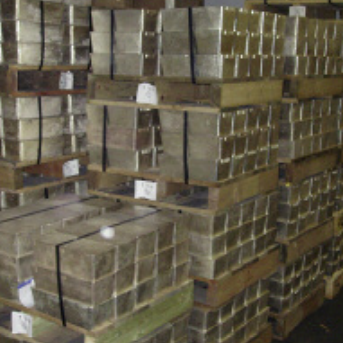 Likewise, in 2015, the Royal Canadian Mint sold gold bullion coins (gold Maple Leafs) containing 29.6 tonnes of gold, and silver bullion coins (silver Maple Leafs) containing 1067 tonnes of silver. Based on 2015 volumes sold of 227 tonnes of silver coins and 24.69 tonnes of gold coins, the Austrian Mint had a silver coin sales to gold coin sales ratio of only 9.19, whereas comparable ratios for the US Mint and Royal Canadian Mint were 47 and 36, respectively. Non-bullion revenue at the Austrian Mint is generated by activities such as producing Euro circulation coins, and producing semi-finished products and medals. 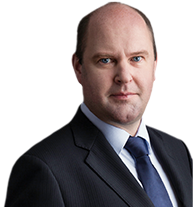 Non-bullion revenues accounted for €248 million or approximately 15% of total Mint revenues during 2015. Interestingly though, although the Mint does not report the geographic origin of its revenues on a segmented basis, it does report the share of revenue derived in Austria vs derived outside Austria. 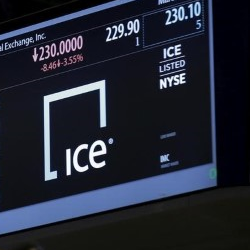 For 2015, €1.258 billion in revenue was generated in Austria vs €360.6 million internationally, meaning that international markets contributed only 22.3% of Mint revenues. Therefore, the domestic Austrian market is still the Mint’s primary market in terms of bullion sales. 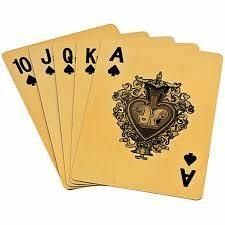 In one way this is not surprising because the Austrian population has a very strong appetite for gold coin and gold bar products, especially gold products from the Austrian Mint in Vienna. The Mint’s gold coins and bars are sold widely throughout Austria in banks such as Bank Austria, the Raiffeisen banks, the Steiermärkische Sparkasse savings banks and through the Erste Bank und Sparkassen group, as well as through the retail branches of gold bullion wholesalers such as Schoeller Muenzhande, which is a fully owned subsidiary of the Austrian Mint. 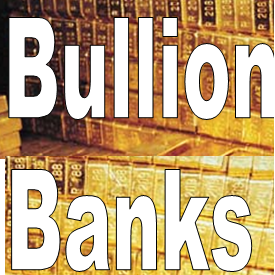 See BullionStar Gold University’s profile of the Austrian Gold Market for more details on the vast network of Austrian bank and wholesalers that sell physical gold coins and bars. For further information on the sales patterns of the world’s largest precious metals mints, please see BullionStar blog “Bullion coin sales boost revenues of world’s largest Mints“.